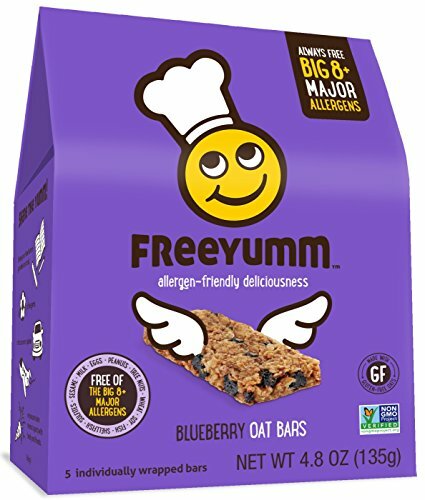 FreeYumm Blueberry Oat Bars are great tasting school safe, nut free, gluten free, dairy free granola bar, a delicious combination of whole grain rolled oats, dried blueberries, sunflower seeds, organic vanilla and cinnamon blended with agave syrup and organic honey. Free of the Big 8+ major allergens, including Peanuts, Tree Nuts, Wheat, Soy, Fish, Shellfish, Sulfites, Sesame, Milk & Eggs, making them school friendly and worry free. Each cookie is individually wrapped for a quick healthy snack that's perfect for kids on the go. They are Non-GMO Project Verified, this healthy & natural snack has simple, healthy ingredients, without any fillers, refined sugars, or preservatives. Purchase contains total of 3 Packs, 5 Bars Per Pack, Total of 15 Bars. Everything that comes through our doors and leaves our bakery is managed and tested to protect you, your family and your friends living with these common food allergies. Why? Because we believe you deserve to share the joy of delicious treats without the worry! SHARE THE YUMM without excluding anyone. Perfect for school, daycare, party favors and bags, sports, or stashed away at the office. Safe for toddlers, children, teens, and adults. If you have any questions about this product by FreeYumm, contact us by completing and submitting the form below. If you are looking for a specif part number, please include it with your message.